Well, the vet called this morning and they had taken some blood. It looks like Coco's albumin is UP to 1.7!!!!! He said this was, "VERY good", and we could expect to see some weight gain over the next few days. She's been bright and active, she's been eating up all of her oats and almost 2 flakes of hay per day. The swelling has stayed down on her belly and ankles. One of her ankles still isn't sitting quite right. Hopefully we'll get some good weather and she can get outside to stretch. We had a great time at Congress! Roscoe was a gem in and out of the show ring. We rode with some of the top individuals in the industry, human and equine. We're still waiting on the results and score sheets but all goals we had were met and or succeeded. All the hours in the saddle, the long drive, the special shoeing, the borrowed equipment, the torn slinkies, the shows when we weren't feeling our greatest, the extra care from everyone around the barn, the good luck wishes and the congratulations on a job well done (despite knowing the placings!) are what it's all about. What a great year for us, thanks to everyone who contributed! The draws were posted this afternoon and Roscoe is draw 32 in the Senior Western Riding. We are guessing it will be late afternoon/evening in the Celeste Center. Roscoe rode really well tonight. He is stalled out in a tent with hardly any other horses in it and seems quite happy. We got his stall organized with the help of our friends from South Florida Equestrian Center last night. He was out for a walk and a light lunge. Tomorrow we ride in the morning again, bath, clip, band and get ready to do our thing with the best in the industry! Coco has been doing well. She bucked in her stall yesterday and dove into her alfalfa! Coconut is still progressing slowly but surely. She's in good hands for the weekend while we head off to the All American Quarter Horse Congress to compete in the Senior Western Riding! Click HERE for more information and for a link to watch what's happening at Congress LIVE! Coco's albumin level was down to 1.2 when we checked it yesterday. We really need it to get up to 2.2 to be in the low-but-safe range. She is, however, behaving better. She's eating more of her hay, interested a little bit in some grain, she's harder to catch in her stall and last night at 11 even tried to steal some hay when we took her for a little walk down the aisle in the barn. Her ringworm is clearing up nicely and the sores on her ankles seem to be clearing up also. The swelling has stayed down on her belly and front legs, there's still a little left on her hind legs. She did have her back ankles tipped up akwardly, likely partly from the swelling and partly from being weak and uncomfortable. Yesterday her right ankle had dropped down into it's natural position. Dear, sweet Coco came was diagnosed on Tuesday of last week with Lawsonia Intracellularis . The bacterial infection causes her protein to be dangerously low. She was showing all the symptoms and when we had her bloodwork done, it didn't even register in the test. Through the week with antibiotic treatment and plasma transfusions her Albumin has increased. On Thursday it registered at 1.2 and on Saturday at 1.4. The normal range is 2.2-3.7. We're hoping Tuesday morning it will still be at 1.4 or maybe even have climbed. She has not had any plasma for 3 days now. 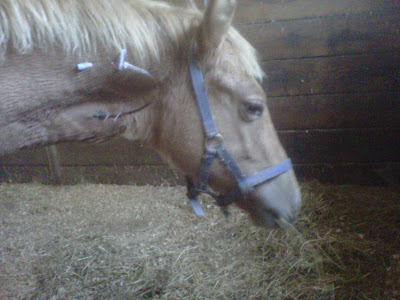 Her weight is way down and she has developed some ringworm on her muzzle and hindquarters. Everything is being treated in the best possible way so we are hoping she has now turned the corner to the road to recovery. What a scary week! Thank you to everyone for their support. I have documented her symptoms, progress, daily routine and medication, and taken several photos. When Coco is a little more stable, I will post some more of this information. The link above describes the condition. The other colt was also tested and was clear.